The aim of this back operation is to relieve you of severe pain and restore stability in your back. The cause of the pain is wear and tear of the disc or intervertebral disc in the lower back. Wear and tear of the intervertebral disc or osteoarthritis of the disc is a normal ageing phenomenon experienced by everyone, although the extent to which it occurs differs from one person to another. Most of the moving links are subject to wear and tear, especially at the neck and lower back. This wear and tear may occur as a result of years of heavy strain on your back, or instability of a link (spondylolisthesis or after a hernia operation). People that suffer from this complain about pain in the lower back and radiating pain in one or both legs, especially after sitting or standing for a while. The pain in the lower back manifests at the least strain, which means that you need to adapt or even avoid most activities, including in your social life. The disc collapses, which means the nerve has less space (reduced neuroforamen, the opening where the nerve leaves the spinal cord) and we often experience additional radiating pain in the legs. 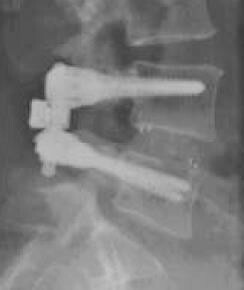 PLIF (Posterior Lumbar Interbody Fusion) is an operation in which the lumbar vertebrae are attached to one another. During the operation you lie in the prone position and we make an incision in the centre of the back. This means your vertebrae are accessed via the back (posterior). The nerves in the legs that extend from the spinal cord are released and the worn intervertebral disc is removed. 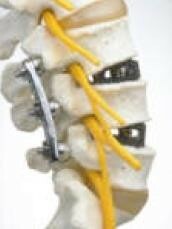 The area where the intervertebral disc has collapsed is lifted by inserting two cages made from carbon fibre. The cages are filled with your own bone and additional bone is also inserted. This bone is obtained from the thorn-shaped protrusion and bone that is removed when releasing the nerves. Lastly, we fix both vertebrae in place with screws, connected with a rod or plate, to improve the stability of the spinal column, (usually made from titanium). After all, the objective of the operation is to fix the worn segments of vertebrae so that movement is no longer possible and the vertebrae have time to fuse thanks to the bone in the cage. This process usually takes several months. You will lie in bed in the supine position the first day after the operation. 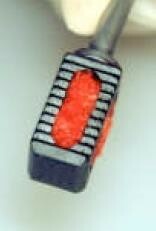 In some cases a drainage tube will be inserted in the wound to eliminate any blood and associated fluid. When you lie on your back it puts pressure on the wound, which reduces post-operative bleeding. On the second day you may get out of bed, helped by the nurse/physiotherapist. As of day three you may calmly walk around the room and perhaps in the corridor. An X-ray is performed to check everything is satisfactory. You will usually be discharged after five days. When you are discharged you will receive a letter to give to your GP. Your GP will take over your pain medication and care of the wound. The stitches can be removed fourteen days after the operation. A corset must be worn for between six and eight weeks. Four weeks after the operation you have a consultation with your surgeon and an X-ray is performed. These operations involve the same (rare) risks that apply to any other operation performed under a general anaesthetic. Preventive measures are taken in order to minimise these risks and include subcutaneous injections to prevent phlebitis as well as you getting out of your hospital bed and moving around. Specific complications inherent to back surgery will be discussed with your treating surgeon. The most common complications are infection, post-surgical root compression, which temporarily causes more leg pain and prevents fusion. The common fear of paralysis and being wheelchair-bound is totally unjustified.